The example on the left shows how filtering options will appear when you are viewing results. In addition to filtering results by Type (e.g. Digital Images or Archival Collections), you can narrow by Libraries & Archives, Topics and Neighborhood. 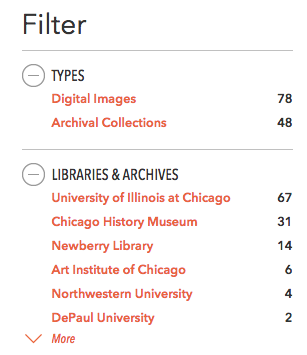 Digital Images versus Archival Collections: If you wish to limit your search to materials such as photographs or documents that are viewable online, click on "Digital Images" under "Types." If you select "Archival Collections" you will see descriptions of collections available for use by researchers at archives and libraries. The contents of archival collections described in this portal vary greatly. Archival collections may include photographs, pamphlets, clippings, memorabilia, correspondence, film reels, administrative records and additional materials held at libraries and archives. You will typically have to visit libraries and archives in person to make use of archival collections although some libraries and archives allow you to request certain materials online. The portal provides in-depth descriptions of these collections to help you determine what collections and materials might be most useful for your research, and to help you determine what portions of a particular collection might be most relevant before you make arrangements to visit a library or archive. 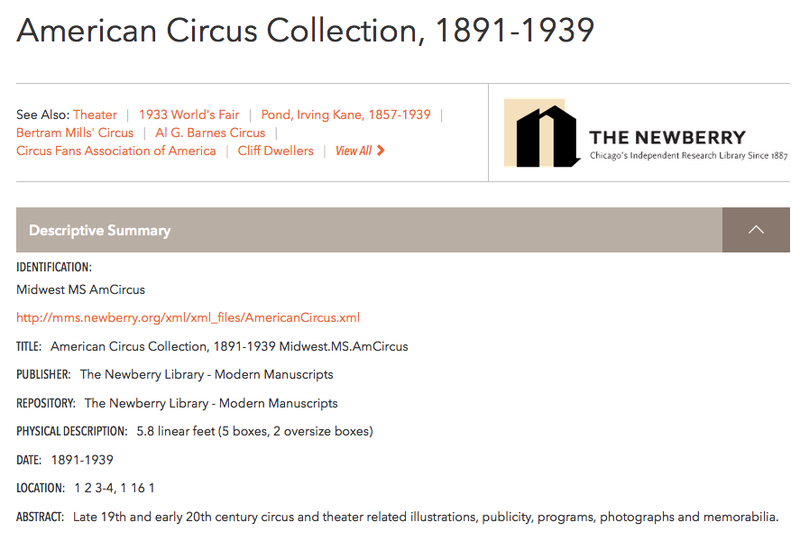 BRIEF RECORD: The following example shows a brief record for the American Circus Collection housed at the Newberry Library. You would need to click on the title (American Circus Collection, 1891-1939) to view more details about the collection. DESCRIPTIVE SUMMARY: When you click on the title of a collection from the list of search results, you will initially link to a descriptive summary of the collection, which briefly summarizes the scope and contents of a collection. 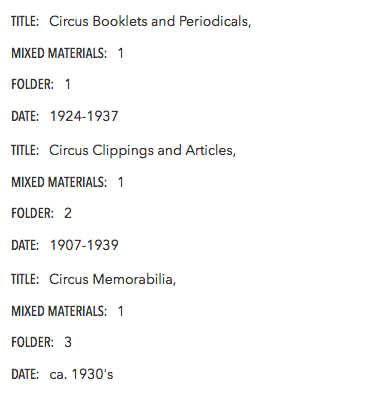 Below is a descriptive summary of the American Circus Collection, 1891-1939, available at the Newberry Library. Brief records provide See Also references to other related collections, such as "Theater" and "1933 World's Fair" in the example below. Additionally, descriptive summaries provide information about where the collection is housed (in this case, the Repository), and the size of the collection (labeled "Physical Description") as well as a short abstract explaining the overall contents of the collection. The Descriptive Summary below also provides a hyperlink to an Electronic Archival Description (EAD) which details the complete contents of the collection. ADDITIONAL COMPONENTS OF DETAILED RECORD: Under the Descriptive Summary, you will see additional categories which further describe the collection. You can open up each item listed by clicking on the arrow on the right. INVENTORY: If you determine you would like to use a particular collection after reviewing the descriptive summary and scope and content information, the inventory will delineate the specific parts of the collection that may be of interest. Listed below are the first three folders of the American Circus Collection. It may be helpful to contact the library or archive where the collection is housed to speak to a librarian or archivist about the contents of the collection listed in the inventory before you visit the collection or request materials online.